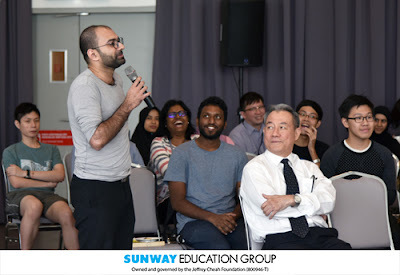 Among the issues addressed were sustainability efforts on campus in conjunction with the launch of the Jeffrey Sachs Center on Sustainable Development in December. 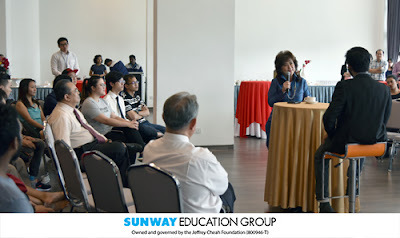 While addressing the various issues, Dr Elizabeth Lee, Senior Executive Director of Sunway Education Group and Sunway University took the opportunity to introduce the academic and administrative teams on campus, providing the students a better picture on the right people who will be able to assist them on campus. Dr Lee addressing a question raised by a student. 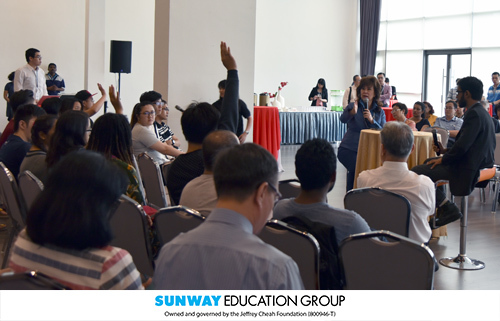 Dr Lee also shared on the various activities and public lectures organised by SEG in collaboration with other institutions and organisations. She stressed on the efforts and hard work required in such collaborations, encouraging the students to take the opportunities presented by actively participating and attending the events on campus. Sakinah Baharom of the BSc (Hons) in Accounting and Finance said, “The town hall meeting serves as a good platform for students to share their opinions and address issues they faced to the person in charge directly.” The second-year student hopes the town hall meeting can be held annually to allow more engagement between students and staff. The administrative and academic teams, including Head of Departments of Sunway University and Sunway College were present at the meeting to assist Dr Lee and take note of all suggestions and feedbacks.